The ZTE Unico Z930G is a 4.5-inch smartphone that comes running Android 4.1 Jelly Bean. The display is a fully touch TFT screen and also the phone is 4G LTE enabled with a dual-core processor. The ZTE Unico Z930G is a GSM phone, meaning it will be activated on the AT&T network, so before making an order, confirm that you have AT&T cell towers or coverage in your home area. Despite the ZTE Unico Z930G being a budget phone, I found it to boast a lot of features as I will discuss in this review. 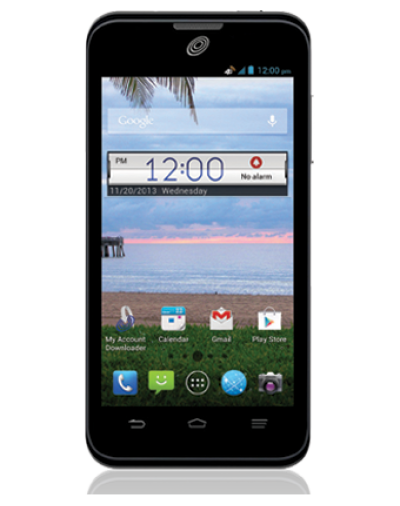 The ZTE Unico Z930G is a prepaid smartphone available from Straight Talk Website. The box comes with gadget, battery, activation card, an 8GB microSD card, service guide and a quick setup guide. Setting up a Jelly Bean phone is a quick and straightforward, so let’s take a tour around the device in the next phase. Like most phones from ZTE, the ZTE Unico Z930G exterior layout is pretty typical, so you don't expect anything out of the ordinary. Just one thing I noticed is the rubberized back cover which feels nice in the palm. The back cover is home to the 5MP camera with its LED flash and a speaker on the lower side. Also, the back cover is removable to reveal the battery compartment as well as the SIM and microSD slots. Coming to the frame layout; we have the power button as well as the headphone jack on the upper edge of the phone, while the lower edge has no button but your microphone. The left edge has the microUSB charging port, and the right edge has the volume rockers. The 4.5-inch display sits on the front. It has the proximity sensor, earpiece, front camera, and LED indicator on the upper part. The traditional navigation buttons sit on the lower part of the display; the good thing is that they are backlit, so visibility in the dark won't be a problem. The arrangement is such that the back navigation button is on the left, the home key in the middle and the menu key on the right. That ends our tour around the device, so we are moving on to the device features. The ZTE Unico Z930G ships with a pretty powerful 5MP back camera and a 1MP front camera. I found the camera to shoot some decent photos which I liked. In low light setting, the back camera has a LED flashlight to illuminate the subject, so pictures come out nice. Even though this is a budget phone, ZTE packed some nice features in the ZTE Unico Z930G camera as I found out, you can set a scene mode for example to auto, portrait, night, or landscape. You can also adjust ISO settings, white balance, geo-tag and exposure time. The front camera, though shot on pixels comes in handy during video calling. Both cameras can shoot decent videos at 720p, which is impressive. Personally, I didn't find any issue with the cameras, and I believe this is a good phone to get by. Onboard the ZTE Unico Z930G is a battery with a capacity of 2070mAh which gives you a talk time of 5 hours and a standby time of up to 8 days. For normal usage, the battery can last a full working day. Since the device is only 4.5-inches, the display doesn't put much strain on the battery. However, with intensive usages, like constant video streaming or gaming will drain the battery faster. Internet services do drain a phone's battery faster, so you will be looking at about 5 hours of usage before finding a charging outlet. The battery is also removable, so you can always have a spare battery as a backup in case your primary battery runs out while on the go. I think having a removable battery that you can replace is a nice thing. The ZTE Unico Z930G comes with a 4.5-inch display that's considerably bright. This is a very compact device that you can operate with one hand. The display is very responsive even to the slightest touch. It supports multitouch, so zooming in and out of items on the screen is very easy. Regarding visibility, the device performed averagely as you would expect from an entry-level device. Indoor Visibility is great, photos and videos show up brightly, and I had no issue with it. The device tries to outperform itself in terms of visibility while outside. Given it has an ambient light sensor, it brightens up considerably while outside. Although in direct sunlight, it may be quite a hassle to see items on the screen. Nevertheless, a 4.5-inch display on a budget phone is a great bargain. You will be impressed by the storage capacity on the ZTE Unico Z930G. The internal storage is only 4GB. And then the device ships with a free 8GB external microSD card. If you combine the two, that's a pretty sufficient storage for your files. Even though an 8GB memory card is included, the device supports up to a 32GB microSD card. What more would you expect from an affordably priced smartphone? Performance wise, the ZTE Unico Z930G stands out compared to other phones in this price range. It ships with a Qualcomm MSM8930 1.2GHz dual-core processor paired with 1GB RAM that gives it the power to handle most of the typical operations flawlessly. The operating system on the phone is Android 4.1 Jelly Bean, which though not the latest, supports most applications on Playstore. The phone is 4G LTE enabled which is an impressive feature on a budget phone. Internet services and browsing are way faster on the ZTE Unico Z930G. YouTube video streaming is enjoyable with no noticeable buffering. The phone is very responsive, and I didn't find any issues with it. Other features of the ZTE Unico Z930G include Wi-Fi, Bluetooth, Proximity/Ambient Light Sensor for controlling screen brightness, GPS for live Google map navigation, and compass sensor to enable operating the phone in landscape. Camera: 5MP back. 1MP front. Processor: Qualcomm MSM8930 1.2GHz dual-core. Battery: 2070mAh removable battery. Talk time up to 5 hours. Standby time up to 8 days. 4GB Internal storage. 8GB MicroSD card included. Supports up to 32GB external microSD card.